The reset check engine lights process takes an extra step on modern cars. Before the deployment of OBD II in 1996, resetting a check engine light was a simple matter. Just disconnect the battery for more than 10 seconds and you’re done. You could even pull the electronic control module fuse on many models. Then OBD II came along. They started rolling it out in late 1995 model year. By 1996 this diagnostic system changed the way car makers set and stored codes inside the on-board computer. If the automobile you’re working on is newer, I Do Not Recommend disconnecting the battery. However, if you stick with me I will explain how to reset check engine lights by disconnecting the battery, even on these cars. Yes, there’s a trick for draining the capacitor that holds power for the electronic control module’s stay alive memory. As a certified professional auto mechanic it’s my duty to let you know what kinds of problems are common when you perform this operation. If the issue is intermittent, the light may stay off for a while. But we have to remember if this is a hard failure with a sensor or a car computer problem the light will come right back on. This is why I ask you to consider pulling the codes and following the diagnosis for the specific code set. Fixing the problem could be easier than trying to avoid it. This is how professional mechanics solve car problems. A new U480 CAN-BUS code reader is not expensive at around 19 bucks including shipping. Here’s another reason for not disconnecting the battery. Newer vehicles have a few installed options requiring constant battery voltage. In addition you don’t want to lose the custom settings like radio stations and power seat memory after getting everything just right. I know what you’re thinking, what if you have to replace the battery. On many luxury cars they store power to hold on to all the vital settings. If you use the method described below you defeat this piece of engineering. In fact, I’ve had the battery out on some Cadillac models for an entire day and didn’t have to reset the clock. On older cars I use a device called a battery tender. These inexpensive devices are sold at most auto parts stores. I have the power-built model shown on the right. You plug it into the cigar lighter or accessories socket before you disconnect the power and ground cables from the battery. The external power source holds the radio station presets and clock settings. But more importantly it also keeps the on-board memory alive for the power-train control module (PCM). This means the car doesn’t have to relearn shift points and idle settings. For example, if you have a theft deterrent radio and you disconnect the battery, it might stop working. When you disconnect the power to reset the check engine light the car radio might go into a self-defense mode.In this scenario it won’t operate until you input a special code. In most cases they include the code in your owner’s manual. Sometimes the dealer supplies it at the time of delivery. This may not do any good if you bought it off a used car lot. Also note that disconnecting the battery on cars with a factory installed alarm or active theft system can cause problems. The owner’s manual might provide a special procedure for disabling the alarm system before disconnecting the battery. Some car makers provide a built in sleep mode for just this operation. Last, but not least, stored in the computer along with the code you’ll find the automobiles learned memory. This stores driving habits like shift points and IAC steps for idle control. You might have stalling and hard shifting problems for a while after reconnecting the battery. It will usually recover automatically, but it can take several drive cycles for this to happen. An easier way to clear the check engine light codes is to use an auto scan tool. These scanners have come a long way and now include better documentation. This will walk you through how to retrieve the codes and reset the check engine light. Clearing codes without disconnecting battery power sidesteps the problems mentioned above. One of the best selling automotive scanners right now, at the time of this writing, is by Innova. However, keep in mind competition is fierce in this market and things change quickly. The good news is this situation is driving prices down and innovation up. If you spend a little more you get a tool you can grow into. Take a look at the customer reviews on this item before buying it. The 3040c model can read the data stream and may be overkill if you just want to reset check engine lights. For people that want to keep it simple yet benefit from on screen definitions then check out the cheaper Equus 3030g below. If you decide to disconnect the battery I have an important tip for you. Most vehicles from 1996 and newer have a keep alive memory built-in to the computer system. Disconnecting the battery alone will not reset the check engine light. The computer will be able to hold the memory and the code for several minutes and in some cases several hours. They supply battery voltage through a capacitor keeping the internal memory alive. The way around this is to disconnect the battery and then hold down on the horn button for at least 30 seconds. The horn circuit is one of only a few that’s hot at all times, regardless of key position. This is why you can blow the horn without having the ignition turned on. Holding down on the horn button drains the electrical current stored in the control module. Using the horn circuit resets the check engine light and all memory related functions on most models. Remember, when you do this you’ll be erasing all memory learned by the computer on previous drive cycles along with radio stations, clocks, seat memory and collected driver information center data like average fuel economy. Therefore, when you reconnect the battery and confirm the reset procedure, you’ll find the engine idle erratic for several drive cycles. The transmission shifts can also feel different from the last time you drove it. This is because the shift point data collected from the transmission speed sensor is gone along with the check engine light code. This problem is short-term and will correct itself after driving the car at highway speeds. Also note if the check engine light comes back on after this reset procedure you have a hard failure code. This is when a malfunction is constant and needs further diagnosis. So to review you do have a few options for resetting your check engine light, but the easiest way is to use an auto scan tool. To the left is one of the cheaper Bluetooth scanners on the market. The 34t5 Bluetooth OBDII scanner for Android devices works great, but you have to get an app from the play store to make it work. I think the best one they call Torque Pro and it’s $5. The tool communicates with all OBD II protocols from 1996-2016.Any of these methods are much better then disconnecting the car battery. Using the automotive scanner tool will avoid all the above-mentioned problems. If you’re interested in a scan tool that can do more, visit the automotive scan tool reviews page. 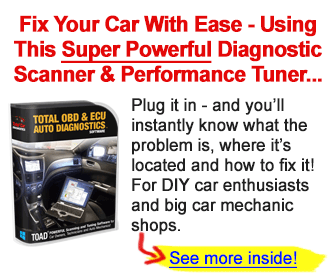 In the auto scan tool section find articles about diagnosing engine lights. Plus more on the reset check engine light procedure using automotive scanners. See if your issue is covered in these in-depth articles. The next link is for the homepage. Learn more about the car mechanic that built this site and review an outline of what’s covered on Auto-Facts.org. Professional mechanics already researched and answered a few common questions. Use these standard diagnostic procedures and techniques to gain positive results on the Diy auto repair page.